The leaves are changing and it is starting to get brisk in the morning. That can only mean one thing, football is upon us. We follow the Pittsburgh Panthers. Unfortunately, there are a large amount of Noon games scheduled. Lets face it, they have not clawed their way back into the national spotlight. So, Noon games mean a breakfast themed tailgate. I was trying to come up with an idea for an easy, make before dish that I could easily cook at the game. So, after careful consideration, I came up with the Biscuit Fattie. What is a Breakfast Fattie? Well, lets just say it is scrambled eggs all wrapped up in a convenient hand held package. Off to the R&D labs we go. 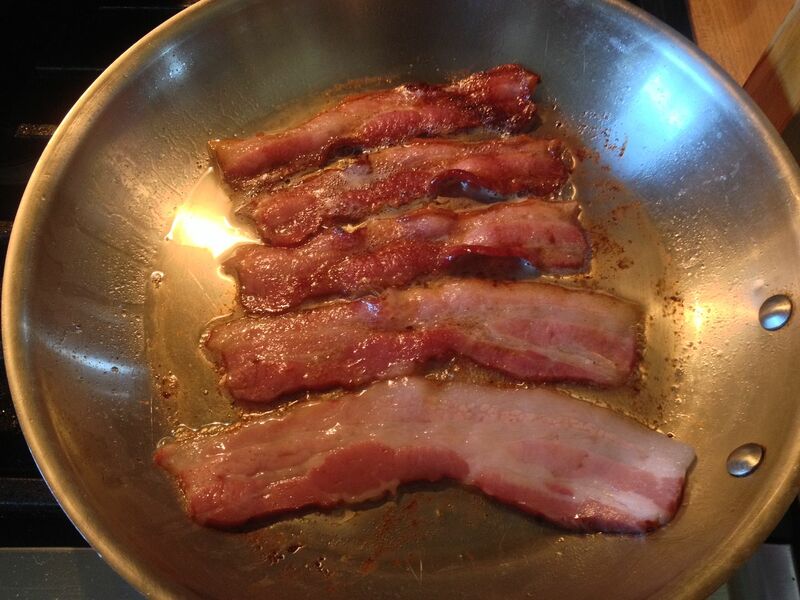 First, I fried some bacon and some bulk breakfast sausage in separate pans. 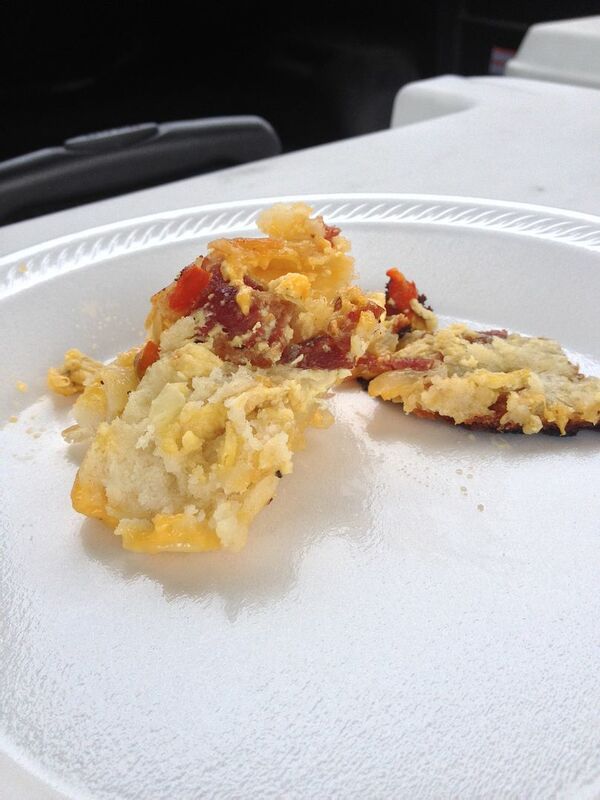 The bacon, I cooked, crumbled and set off to the side. The grease was disposed of and a clean pan used for the next step. I heated some olive oil, sautéed some pepper and onion, then added two well beaten eggs. 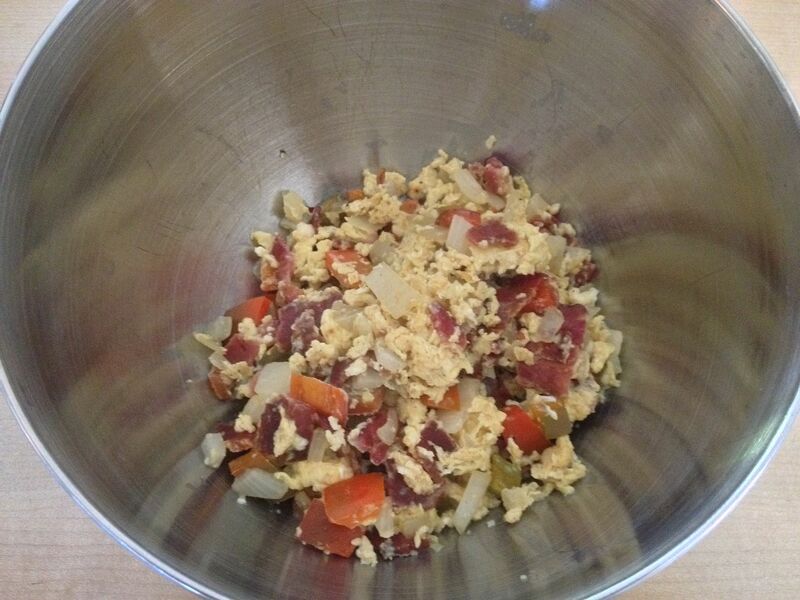 When cooked, I added the bacon to the mixture, then placed in the refrigerator to cool. 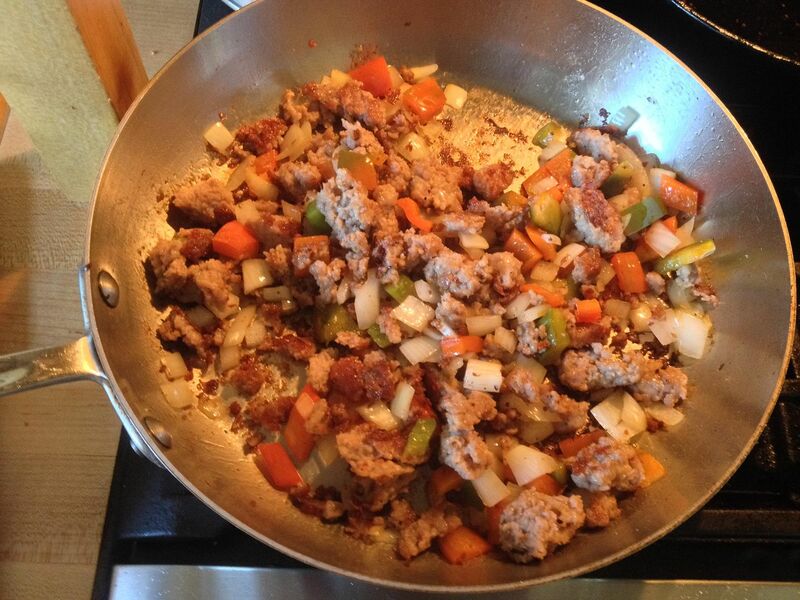 For the sausage, I cooked until crumbled, then added diced bell pepper and onion and cooked until translucent. 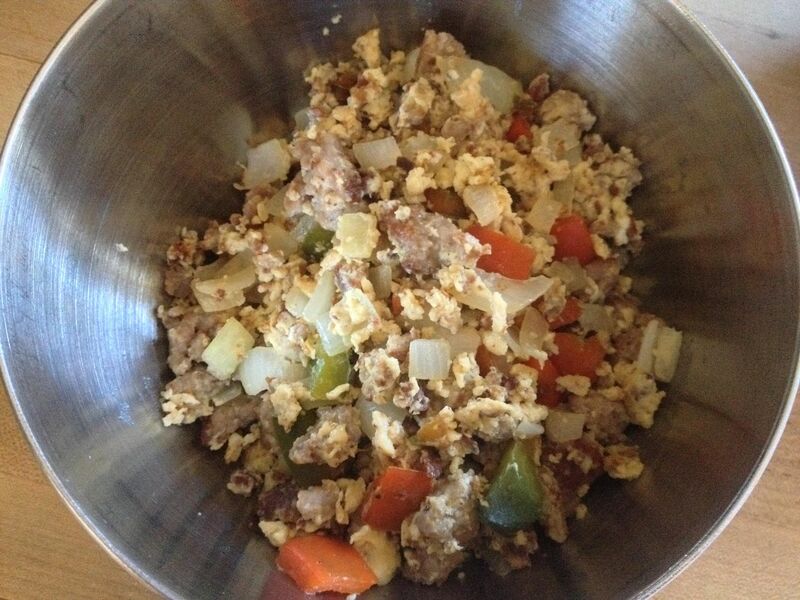 Then, I added two well beaten eggs. I also placed the cooked mixture in the refrigerator to cool. 1. Add butter to flour and use a pastry blender (or two butter knives) to cut the butter into the flour until crumbly and mixture resembles small peas. Cover and chill 10 minutes. Add buttermilk, stirring just until dry ingredients are moistened. 2. Turn dough out onto a lightly floured surface; knead 3 or 4 times, gradually adding additional flour as needed. With floured hands, press or pat dough into a ¾-inch-thick rectangle (about 9 x 5 inches). Sprinkle top of dough with additional flour. 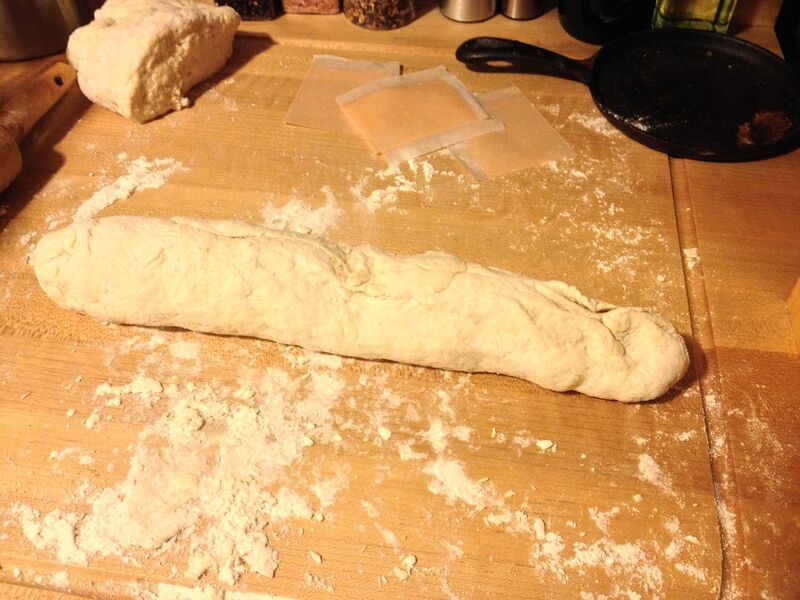 Fold dough over onto itself in 3 sections, starting with 1 short end. (Fold dough rectangle as if folding a letter-size piece of paper.) 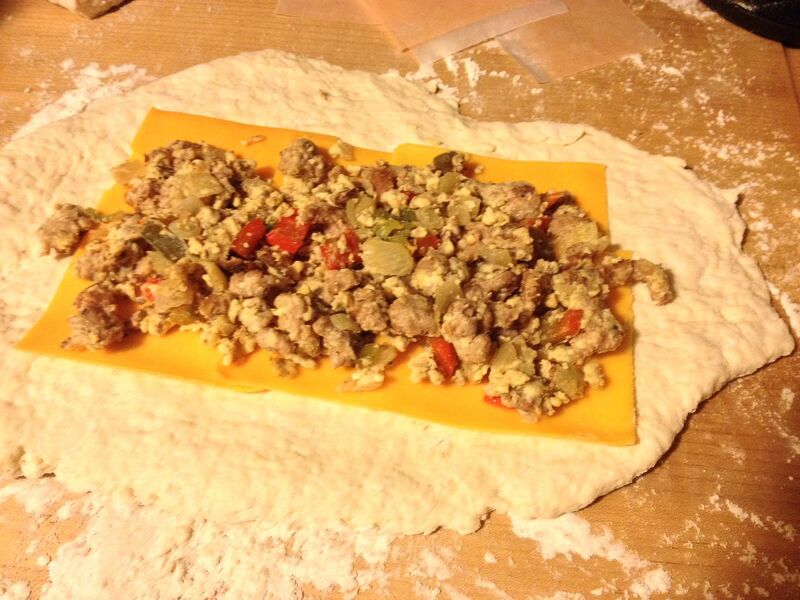 Repeat entire process 2 more times, beginning with pressing into a ¾-inch-thick dough rectangle (about 9 x 5 inches). *To make your own self rising flour, simply add 1 ½ tsp baking powder and ½ tsp salt for EACH cup of all purpose flour. Fresh buttermilk makes for a fluffier biscuit. A baking stone is best, but a pizza pan or cookie sheet works just as well. I don't brush with butter. Original recipe calls for ½ cup of butter. ¼ cup works just as well. Let just skip the baking part for now. I split my dough in half to make two fatties. When rolled out on a well floured surface, I layered with thin sliced sharp cheddar, then for the second layer I placed my egg filling. Next, I rolled it up, and sealed all of the holes so the cheese would not run out. Then I wrapped in wax paper and placed in the refrigerator until the next day. The next day at the tailgate, I started a fire in my grill and placed the lit coals off to one side. 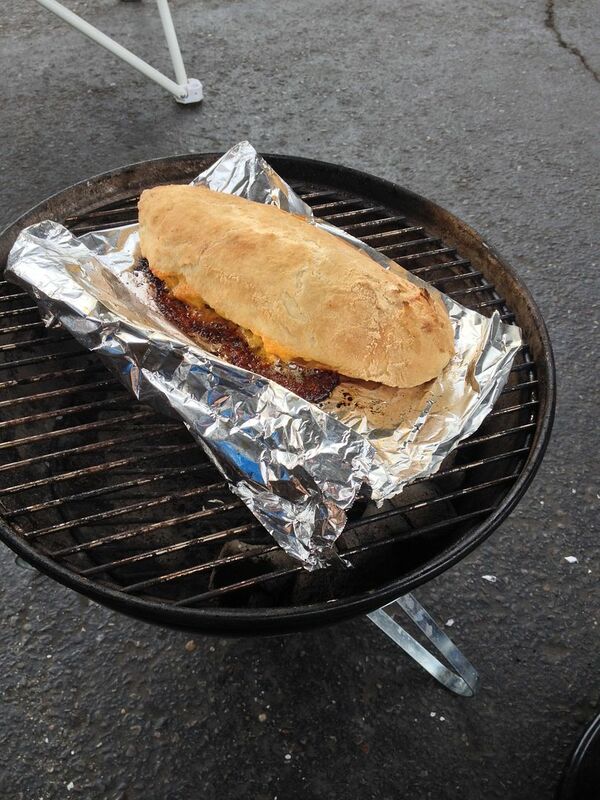 Then, I placed a piece of aluminum foil on the grill grate, then placed the unbaked fattie on the foil. I covered the grill to bake. Every 15 minutes I rotated the fattie so that it did not get too brown on one side. After about 45 minutes, it was ready to eat. As you can see, the cheese always seems to find the holes in the dough and run out. But, who doesn't like toasted cheese? After sitting for 10 minutes, I sliced and served. Not bad. Fluffy biscuit wrapped around cheesy scrambled. The perfect tailgating meal that lets you walk around with a frosty beverage in your other hand. Next time, I think I am going to make mini-biscuit shaped sandwiches to cut down on baking time. If you wanted to make this at home, no problem. Just bake at 450 F per the biscuit recipe until golden brown on the outside. Gus, I just ate dinner and I could tear into that as well. Biscuits are like crack to me. I could eat a whole batch! That sounds great but it would not work at our tailgate. It would become way to salty from our Oakland Raider tears. Have you considered a new team? Born and raised in Oakland. You just do not jump ship because your team has sucked for a decade just like you do not get a new wife when.......... Maybe I should just leave that one alone.